I made this Distressed brown leather tote bag from high quality brushed sturdy Italian leather. I use this vintage leather that in this tote, is known to age beautifully. It will collect the marks of its adventures and develops a patina with time. It is as beautiful as it is practical. Perfect for tablets, notepads, binders and all your daily essentials. Strong enough to carry a laptop! - Open interior leather pocket for pens, cell phone, keys, etc. - Fit laptop up to 14in (or you can put 15.6 in laptop will be high in 1.5in) . Another beautiful COLOR OPTIONS: You can choose any leather color you where dreaming of. Just write to . 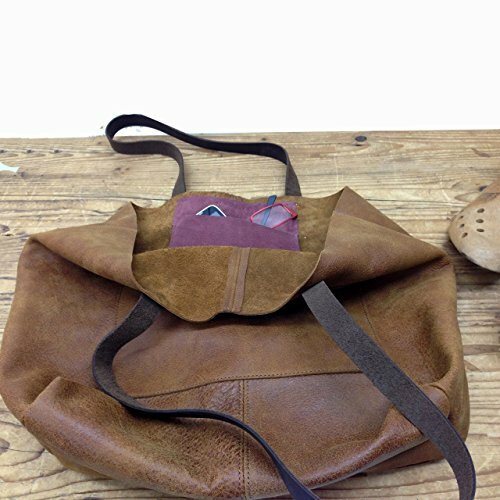 SAMPLES OF A HAPPY CUSTOMERS REVIEWS: (from my oldest shop) "I can't begin to tell you how much I love my new bag. The craftsmanship is supurb. I love the dark gray color of the soft leather - reminds me of the feathers on a dove. The communication with Limor was pleasant. She is kind and helpful. Overall, a great transaction and a bag that is a true work of art." All items in the shop are handmade with love and attention in my studio in Israel. If you have any questions, please do not hesitate to contact me. If you have any questions about this product by Leather Bags and Accessories Handmade by Limor Galili, contact us by completing and submitting the form below. If you are looking for a specif part number, please include it with your message.